360Works at DevCon 2018: Discount Extended! We had a great time at the 2018 FileMaker Developer Conference in Grapevine, Texas. Nothing gets the 360Works team more excited than demonstrating our products and meeting other FileMaker Developers! 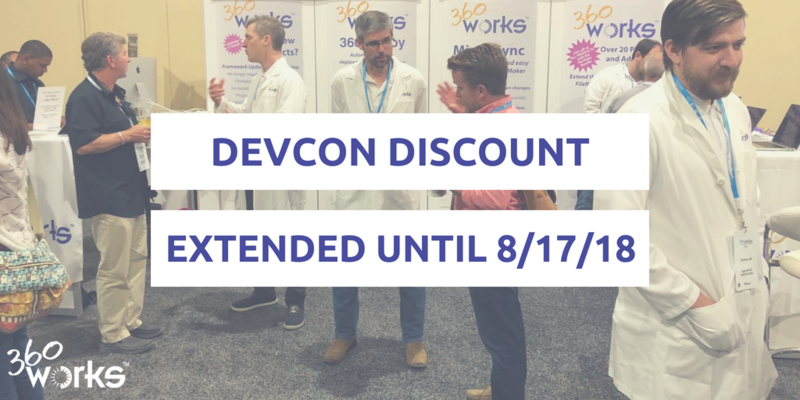 We are pleased to announce that we will be extending our DevCon discount until Friday, August 17, 2018. Enter code DEVCON18 at checkout and receive 15% off of your purchase! Use the product table below to learn more about your favorite products and take advantage of the discount. At DevCon this year, Joe Martin demonstrated the brand new 360Deploy 2 for completely automating deployment of development changes to a production server and Jesse Barnum demonstrated a new version of MirrorSync, version 5, which has more convenience for end users and over 40 improvements to reliability, speed, and stability. At our booth, the MirrorSync Setup Station allowed many DevCon attendees to return home with a fully functional sync setup and Richard Carlton Consulting gave out free FileMaker 17 training books at our booth this year!